Well, I say new, it's a few days old and I only just remembered to link to it here - sorry everyone! Bob from Brockley hosts an eclectic and excellent new edition of the Carnival of Socialism using as his themes "optimism and pessimism". Not to be missed! The next edition of the Carnival will be over at the Great Unrest at the beginning of Feb. Drop them a line if you have a blog post that you think they should include. After that Phil at AVPS will be hosting in mid-Feb and Louise at HarpyMarx will be with us for the end of Feb edition. Looking good! If you want to host an edition of the Carnival simply leave a comment below and I'll book you in. We have dates and places lined up for the next two editions of the Carnival of Socialism. Neither of these lefty bloggers have hosted the Carnival before and as always it's a great pleasure to welcome new blood. On the 1st January we have a New Year's edition with Alex at Luna17. On the 20th January we're with Bob from Brockley. I'm sure they'll welcome all suggestions of good socialist posts you've spotted, or written even. If you would like to volunteer for an edition after that, perhaps the first of Feb, then leave a comment and we'll sign you up. I think this is one of the best carnivals we've ever had. A big thank you to River's Edge - who's next for the Christmas edition? We seem to have hit the buffers again! If any socialist blogger wants to volunteer for the next edition of the carnival please do step forward - it would be great to get the Carnival up and running again. We've had a couple of people express interest in hosting a Carnival of Socialism so we're going to give it shot getting the old girl back up and running. As part of that I've set up a Carnival of Socialism discussion group open to all leftwing *bloggers* with the aim of a) getting the Carnival back up and running and b) bringing the socialist blog-o-sphere closer together. If you'd like to join send me your email and blog address and I'll add you to the list. Once I've worked out how it's done I'll add something to the site so people can sign themselves up without having to go through me. Email me at jimjepps at hotmail dot com. Looking forward to hearing from you all! And we have lift off with a Jacob special over at the Third Estate. Great to see the Carnival of Socialism up and running again - now who wants to go next? If you fancy having a go at the Carnival yourself we're opening up the calendar again, but having learned the hard lessons of the past we'll only book three Carnivals in advance so we don't book people so far in advance they forget they're a blogger, let alone that they are doing the Carnival! Leave a comment below if you want to book yourself into either the 30th May or 13th June. A new Carnival of Socialism (47) is ow up over at Rivers Stream, check it out! New Carnival of Socialism is go! Carnival of Socialism number 46 is now up down by the Rivers Edge. Go check it out! Dave Semple has taken the bull by the horns and just got on and done a Carnival of Socialism on Copenhagen because one was sorely needed - well done! I think it's time we invited a couple more admins onto the site to ensure that the Carnival keeps moving even when the current admins are too busy! New Carnival of Socialism over at Harpy Marx - check it out! Post your submissions over at Harpy Marx. Carnival of Socialism Halloween Special! Go and check out the Halloween Special over at Ten Percent - fantastic! In two weeks time, on the 14th, the carnival will be hosted over at Harpy Marx. Do send her your submissions. The Carnival seems to have been derailed (you can derail a carnival, right?) over the last month - normal service will return asap. Thank you for your commendable proletarian patience. 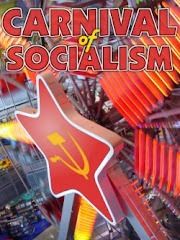 New Carnival of Socialism out courtesy of Trotfinder. Excellent stuff. I had to think a bit before accepting the task because the SPGB is, of course, well known for its clause 7 and views that stand in direct contrast to most left politics, such as: workers shouldn't vote Labour; leninism isn't a development of marxism; state ownership is state capitalism; and Russia et al did not establish socialism nor were/are they "degenerate workers' states". However, I did promise PhilBC that I would refrain from calling everybody else a bunch of non-socialist reformists. So I shalln't! Excellent new Carnival of Socialism out over at the Red Wombat Hole. Good stuff, go check it out.